Half day classroom, online, or blended. Preview this workbook immediately. You have a talented team, and you focus significant time and energy to help them address and resolve performance issues. But there is a difference between job performance and work habits. Effective managers and team leaders can identify opportunities for team members to improve work habits and help their team reach the next level. 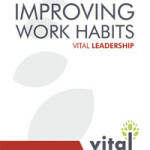 Employees with good work habits are more productive and attentive to quality. Learning how to distinguish between job performance and work habits, and developing your ability to provide constructive coaching around team members’ work habits, will help ensure your team is efficient and effective. 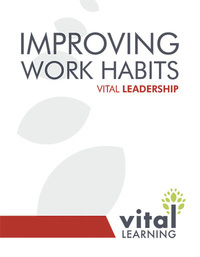 The Vital Learning Improving Work Habits™ course provides supervisors, team leaders and managers with the tools necessary to recognize and address poor work habits. The course helps managers and team leaders understand the importance of focusing on negative behaviors and earning team members’ recognition of the problem and commitment to change their habits. Using the tools and skills learned in the course, managers and team leaders can effectively address issues before they develop into disciplinary problems that affect everyone on the team. Click the “e” to immediately order and begin the Improving Work Habits online course.